This article attempts to trace the evolution of the Pakistan’s Unmanned Aerial Vehicle (UAV) capability over the years and analyses the impact of the proposed sale of 48 Chinese Wing Loong II armed drones to Pakistan. The humble beginnings of the Pakistani indigenous UAV development programme can be traced to a period around 1997-981, which was the time when India was going in for import of Searcher Mk 1 UAV from Israel and the Defence Research & Development Organisation (DRDO) was already a few years into its research & development (R&D) effort into designing indigenous UAVs. Initially, two public sector companies in Pakistan took the lead in the development efforts. These were Pakistan Aeronautical Complex (PAC) and Air Weapon Complex (AWC). Later, several other private sector players joined in, like Associated Consulting Engineers (ACES), Integrated Dynamics, SATUMA (Surveillance & Target Unmanned Aircrafts), GIDS (Global Industrial & Defence Solutions), NESCOM (National Engineering & Scientific Commission), and more. The initial development by PAC was the ‘Ababeel’ lightweight military drone which was basically designed as an aerial target for testing new types of weapons in live firing.2 Initially it operated in the visual range (5+ km) later, a beyond visual range version of the drone (upto 140 km) was introduced, called Ababeel III. Another target drone called ‘Bazz’ (range up to 200 km) was produced a few years later by the PAC. This was followed by the next product in from PAC and ACES around 2007-08 called the ‘Uqaab’ tactical drone which had the capability of intelligence gathering, surveillance, target acquisition and reconnaissance (ISTAR)3 upto a range bracket of 300-350 km with an endurance of 5-6 hours . At around the same time, the AWC produced the ‘Bravo’ (and Bravo +) UAVs which had a tactical range of 80 km, capable of reconnaissance, surveillance, battle damage assessment and artillery fire support4. Then came ‘Jasoos’ series of UAVs manufactured by SATUMA. These had a range of 100 km and an endurance of over 5 hrs with better ISTAR capabilities than Bravo5. Other indigenous products from the same vendor have been ‘Mukhbar’ and ‘Flemingo’ UAVs. Mukhbar is a short-range reconnaissance UAV with a range of 50 km and an endurance of 1.5 hours. Flemingo has a range of 200 + km and an endurance of 6-8 hours.6 . This vendor also makes ‘Stingray’ mini UAV for 'around the corner' and 'over the hill' surveillance (range 45 km endurance 1 hour)7. ‘Vector’ UAV is another indigenous product in the medium sized UAV class with a range of 200 km and an endurance of 4-5 hours, produced by Integrated Dynamics8. This vendor also produces ‘Shadow’ Mk II surveillance drones9, ‘Vision’ Mk I and II surveillance drones (range 100 and 150 km, endurance 5 hours+), ‘Tornado’ and ‘Nishan’ target drones, ‘Border Eagle’ surveillance drone, ‘Hornet’ surveillance drone and ‘HUMA 1’ remote sensing drone10. Another very peculiar thing in the holding of Pakistani UAV arsenal is the fact that besides its many indigenous versions, it holds small quantities of UAVs from several different countries. For instance, it is known to hold ASN 105A and ASN 206 UAVs from China (105A - Range 155 km endurance 2 hours; 206 - range 200 km endurance 6-8 hrous), Luna UAVs from Germany (range 100 km endurance 5 hours), Snipe Mk II and Streak UAV from UK (Snipe - range 8 km endurance 35 mins; Streak - Range not known, endurance 20 mins), Falco UAV from Italy ( range 200 Km endurance 8-12 hours) and Seeker UAVs from South Africa ( range 200 Km, endurance 9 hours). The non-combatised UAV arsenal of Pakistan and Pakistan UAV industry starting from its baby steps around 1997-98, has progressed steadily with active participation both from the public, as well as, private industry. The indigenous capability covers the complete UAV functional domain of reconnaissance, surveillance, battle damage assessment, direction of artillery fire, target acquisition, contaminated area sampling, target support for live firing and more, besides a host of conventional civilian uses. Holding small quantities of UAVs in different genres from several countries is likely to have enabled Pakistan to catalyse its indigenous efforts in reverse engineering mode. Weapon systems configured on a conventional UAV make it a combat UAV or Unmanned Combat Aerial Vehicle (UCAV). In this, the primary UCAVs are the ones that are originally designed as such , for instance Predator or Reaper class of UCAVs, while another option is to retrofit weapons on conventional UAVs normally referred as Weapon Systems Integrated (WSI) version. 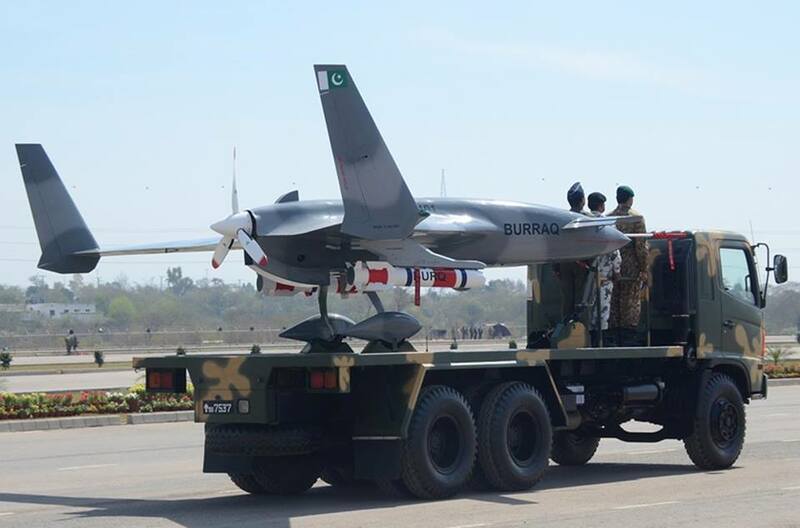 Right from the early days of Global War on Terror unleashed by US after 11 Sep 2001 and more lately post the commencement of the Af-Pak war, Pakistan has been wanting to get the Predator type of drones from the US for monitoring its 2500 km Durand Line11. The same never came about (possibly due to US apprehensions on technology proliferation) 12. Faced with the above situation, the development of an indigenous UCAV began in 2009 when the contract for making the same was awarded to the National Engineering & Scientific Commission (NESCOM). The UCAV was named ‘Burraq’. The name Burraq comes from a legendary creature mentioned in the Holy Qur'an which carried the Muhammad from Mecca to Jerusalem to Heaven and back to Mecca during Mi'raj (the night journey). The development of Burraq proceeded in secrecy, it is believed that the same has been mostly influenced by the US Predator and the Chinese Rainbow CH-3 UCAVs13. Rainbow UCAV has a range of 960 km and an endurance of 12 hrs. It carries YC 200 guided bombs and AR-1 air to ground missile14. Burraq has a range of 1000 km, its maximum speed is 215 km/h and a service ceiling is 7500 meters. It carries two ‘Barq’ air-to-surface laser guided missiles15. Barq, which means lightening in Urdu, is single stage missile capable of destroying both stationery, as well as, moving targets16. And now a word on the current Chinese offer. It is reported that China is likely to sell 48 numbers of its high-end reconnaissance, strike and multi-role Wing Loong II UCAVs to Pakistan. The cost of the deal has not been revealed.19 This is not a straight 'sell' deal, in that, the agreement between the State owned Aviation Industry Corporation of China (AVIC) and Pakistan Aeronautical Complex (PAC) is for co-production of 48 Wing Loong II UCAVs, which by implication, is likely to involve Transfer of Technology (ToT). 20. Wing Loong II is a Medium Altitude Long Endurance (MALE) UCAV developed by the Chengdu Aircraft Industry Group. It has a range of 4000 km, an endurance of 20 hours, a service ceiling of 5000 meters and a maximum speed of 370 km per hour. This UCAV is an improved version of its predecessor Wing Loong 1. The current version has an optimized aerodynamic design, improved airframe and upgraded airborne systems which feature better capability in terms of flight, payload and information capacity. It is equipped with satellite communication (SATCOM) system. Its electro-optical payload pad fitted under the forward section of the fuselage is integrated with daylight and infrared cameras and sensors to collect surveillance and targeting data in both day and low-light/night conditions21. As to its combat teeth, the UCAV can carry a payload of 480 kg (1060 Ibs) of air-to-surface weapons. These could be precision guided munitions in terms of guided bombs ( FT 7- 130 kg bomb with planner wing, FT 9 - 50 kg bomb, FT 10 - 25 kg bomb, GB 7 - bomb based on radio command mode of guidance, GB 10 - a flare seeker bomb based on infrared mode of guidance) or air-to-surface missiles and guided rockets. For missiles and rockets, there are two versions , one for soft targets and the other for armoured targets. In the soft target category, there is AKD 10 missile suitable for targets like bunkers, fortifications and vehicles. For the armoured targets, there is a guided rocket BRM 1. This rocket is based on semi-active laser guidance with a range of 8 km and is suitable against infantry concentrations, armoured vehicles and other high value targets like air defence and artillery22. In a pure missile payload configuration, the UCAV can carry 12 laser guided air-to-surface missiles or YJ9E anti-ship missiles23. In another combination of payload, Wing Loong can carry the Chinese made BA-7 air to ground missiles, YZ212 laser guided cluster bombs, YZ 102A cluster bombs and 50 kg LS-6 miniature guided bombs24. Wing Loong II is comparable to the front line UCAVs of the leading nations like MQ-1 Predator UCAV (US), BAE Mantis Unmanned Autonomous System Advanced Concept Technology Demonstrator UCAV (UK) and Elbit Hermes 900 tactical MALE UAV ( Israel) 25. The deal marks a major qualitative enhancement in the UCAV arsenal of Pakistan. The most notable feature in this deal relates to co-production clause which by implication is likely to involve ToT. Such a ToT will be a major shot in the arm for Pakistan which is likely to give it a quantum jump from Burraq standards right up to the category of front line of UCAVs of the class to which Wing Loong II belongs. The proposed sale will bring a paradigm enhancement in the quality and quantum of surveillance, reconnaissance, target acquisition, and intelligence gathering capability based on unmanned machines. 20 hours of endurance is a way out capability with which will permit the UCAV to loiter in the target area for considerable duration before the strike mission is executed. Extended duration reconnaissance and surveillance of battlefield is a tangible capability enhancement. Of special relevance in this context is the electro-optical payload pad of the UCAV which is fully integrated with the day light and infra-red cameras and sensors to collect surveillance and targeting data both in day and low light/night conditions26. The real gain will lie in the enhanced strike capability. In that, given a very versatile range and options for arming Wing Loong II, Pakistan will gain substantially in its kill capability to take on various targets both in the anti-terrorist operations, as well as, conventional military targets in tactical battle area. Given the frontline status of the Wing Loong II UCAV, it is likely to provide the capability of Manned and Unmanned Teaming (MUM-T) where it could be taking part in joint operations with the manned aircrafts/attack helicopters increasing the cumulative reconnaissance and kill capability of the joint missions, manifold. "A Complete detailed analysis of Pakistan made Drones and UAVs," at www.pakistanibychoice.worldpress.com. Accessed 16 Dec 2018. "GIDS - UQAB -UAV," at gids.com.pk. Accessed 16 Dec 2018. "PAF UAV inventory", at https://www.defence.pk...Pakistan air force. accessed 16 Dec 2018. "SATUMA Flamingo" at satuma.co..pk. accessed 16 Dec 2018. "Stingray", at www.ruvsa.com. Accessed 16 Dec 2018. Integrated dynamics", at wwwidaerospace.com. Accessed 16 Dec 2018. "List of unmanned aerial vehicles- Pakistan," at www.en.wikipedia.org. Accessed 16 Dec 2018. Bokhari Farhan " Pakistan to deploy its own UAVs over FATA" Janes Defvence Weekly 2014.
" NESCOM Burraq" at www.en.wikipedia.org. accessed 16 Dec 2018. "NESCOM Burraq Unmanned Combat aerial Vehicle," at www.militaryfactory.com. Accessed 18 Dec 2018. "Pakistan to show missile muscle," at www.defwnce .pk. accessed 19 Dec 2018. "Pakistan surprises many with first use of armed drone," at www.defencenews.com. Accessed 19 Dec 2018. "China to sell 48 high-end military drones to Pakistan," at www.economivtimes.indiatimes.com. accessed on 19 Dec 2018. "China, Pakistan to co-produce 48 strike capable Wing Loong II drones, " at www.thediplomat.com. Accessed 19 Dec 2018. "Wing Loong II MALE..." at www.armyrecognition.com. Accessed 19 Dec 2018. "The missiles of Zhuhai: China displays new strike arsenal," at wwwpopsci.com. Accessed 19 Dec 2018. "Wing Long II : Latest current affairs and news," at https://current affairs.gktoday.in. Accessed 19 Dec 2018. "China's Wing Loong II aerial drone built to rival US MQ 9 Reaper," at www.chinatopix.com. Accessed 19 Dec 2018. "Wing Loong II," at www.en.wikipedia.org. Accessed 19 Dec 2018. Wing Loong UAV," at www.airforce-technology.com. Accessed 19 Dec 2018.